Around the world a multitude of surveys are conducted every day, on a variety of subjects, and consequently surveys have become an accepted part of modern life. However, in recent years survey estimates have been increasingly affected by rising trends in nonresponse, with loss of accuracy as an undesirable result. Whilst it is possible to reduce nonresponse to some degree, it cannot be completely eliminated. Estimation techniques that account systematically for nonresponse and at the same time succeed in delivering acceptable accuracy are much needed. 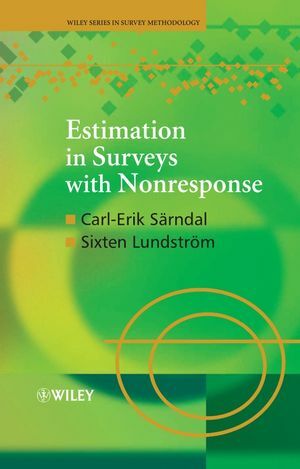 Estimation in Surveys with Nonresponse provides an overview of these techniques, presenting the view of nonresponse as a normal (albeit undesirable) feature of a sample survey, one whose potentially harmful effects are to be minimised. Builds in the nonresponse feature of survey data collection as an integral part of the theory, both for point estimation and for variance estimation. Promotes weighting through calibration as a new and powerful technique for surveys with nonresponse. Highlights the analysis of nonresponse bias in estimates and methods to minimize this bias. Includes computational tools to help identify the best variables for calibration. Discusses the use of imputation as a complement to weighting by calibration. Contains guidelines for dealing with frame imperfections and coverage errors. Features worked examples throughout the text, using real data. The accessible style of Estimation in Surveys with Nonresponse will make this an invaluable tool for survey methodologists in national statistics agencies and private survey agencies. Researchers, teachers, and students of statistics, social sciences and economics will benefit from the clear presentation and numerous examples. Carl-Erik Särndal, Ph.D., is Consultant to National Statistical Agencies and was formerly Professor, Université de Montréal. He is the author, or a co-author, of many articles on survey sampling theory and applications. Sixten Lundström, Ph.D., is Senior Methodological Adviser, Department of Population and Welfare Statistics, Statistics Sweden. He has extensive experience of survey practice, especially in the production of official statistics. Chapter 2: The Survey and Its Imperfections. 2.2 Sources of error in a survey. Chapter 3: General Principles to Assist Estimation. 3.2 The importance of auxiliary information. 3.3 Desirable features of an auxiliary vector. Chapter 4: The Use of Auxiliary Information under Ideal Conditions. 4.3 The generalized regression estimator. 4.4 Variance and variance estimation. 4.5 Examples of the generalized regression estimator. Chapter 5: Introduction to Estimation in the Presence of Nonresponse. 5.2 Errors caused by sampling and nonresponse. Appendix: Variance and mean squared error under nonresponse. Chapter 6: Weighting of Data in the Presence of Nonresponse. 6.1 Traditional approaches to weighting. 6.2 Auxiliary vectors and auxiliary information. 6.3 The calibration approach: some terminology. 6.4 Point estimation under the calibration approach. 6.5 Calibration estimators for domains. 6.6 Comments on the calibration approach. 6.7 Alternative sets of calibrated weights. 6.8 Properties of the calibrated weights. Chapter 7: Examples of Calibration Estimators. 7.1 Examples of familiar estimators for data with nonresponse. 7.2 The simplest auxiliary vector. 7.4 A single quantitative auxiliary variable. 7.5 One-way classification combined with a quantitative variable. 7.7 A Monte Carlo simulation study. Chapter 8 The Combined Use of Sample Information and Population Information. 8.1 Options for the combined use of information. 8.2 An example of calibration with information at both levels. 8.3 A Monte Carlo simulation study of alternative calibration procedures. 8.4 Two-step procedures in practice. Chapter 9 Analysing the Bias due to Nonresponse. 9.1 Simple estimators and their nonresponse bias. 9.2 Finding an efficient grouping. 9.3 Further illustrations of the nonresponse bias. 9.4 A general expression for the bias of the calibration estimator. 9.6 A review of concepts, terms and ideas. Appendix: Proof of Proposition 9.1. Chapter 10: Selecting the Most Relevant Auxiliary Information. 10.2 Guidelines for the construction of an auxiliary vector. 10.3 The prospects for near-zero bias with traditional estimators. 10.4 Further avenues towards a zero bias. 10.5 A further tool for reducing the bias. 10.6 The search for a powerful auxiliary vector. 10.7 Empirical illustrations of the indicators. Chapter 11: Variance and Variance Estimation. 11.1 Variance estimation for the calibration estimator. 11.2 An estimator for ideal conditions. 11.4 Variance estimation for the two-step A and two-step B procedures. 11.5 A simulation study of the variance estimation technique. 11.6 Computational aspects of point and variance estimation. Appendix: Properties of two-phase GREG estimator. 12.4 The full imputation approach. 12.6 The full weighting approach. 12.7 Imputation by statistical rules. 12.8 Imputation by expert judgement or historical data. Chapter 13: Variance Estimation in the Presence of Imputation. 13.1 Issues in variance estimation under the full imputation approach. 13.2 An identity of combined and fully weighted approaches. 13.3 More on the risk of underestimating the variance. 13.4 A broader view of variance estimation for the combined approach. 13.5 Other issues arising with regard to item nonresponse. 13.6 Further comments on imputation. Appendix: Proof of Proposition 13.1. Chapter 14: Estimation Under Nonresponse and Frame Imperfections. 14.2 Estimation of the persister total. 14.3 Direct estimation of the target population total.